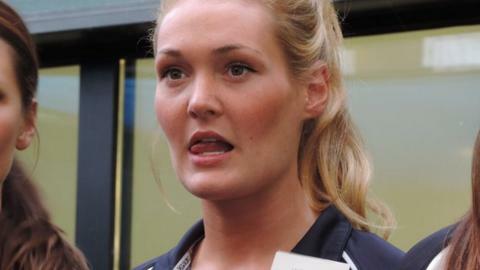 Team Jets skipper Lauren Devine will feel a "massive sense of pride" when she leads Jersey's top netball side into the national leagues for the first time in their history on Sunday. Jets were after an unbeaten South West regional campaign. They start away at Sussex Thunder, who finished ninth in the division last season. "I'm nervous, excited and just ready for it," Devine told BBC Radio Jersey. "The first match is really important and we'll get to see how we fare against teams that have been there last year. "I'm just glad the first game's not at home for my nerves and for the girls' nerves." Calli Bushell and former captain Jenna Meredith are unavailable this year, but Georgia Hickey is back in Linda Andrews' squad after returning to the island from Australia. Jets begin the season with two away fixtures, with the game at Sussex Thunder followed three weeks' later by the trip to Bromsgrove to face Ryland. The Jersey side are boosted by the news that all nine of their home matches will be played in the island this season. In previous campaigns, opponents were not always keen to make the journey across the Channel because of the cost involved, but Jets have confirmed they will stage all their home game on a new surface at Les Ormes. "We've worked really hard. We know what we can do and it's just whether we can do it on court now that'll be the big teller," said Devine. "There are 16 girls competing for places. We've lost two with Calli Bushell now dedicating her time to boxing and Jenna has left us for personal reasons. "We don't want to just fit middle of the table. If were still playing well and we're winning these games, then why not go for promotion?"